Cabbage is a leafy green, and leafy greens tend to offer many health benefits. It is an ample source of dietary fiber and antioxidant vitamins. Not only that, its crunchy texture and bitter sweet taste make it a favorable ingredient in plenty dishes. This is easy to do and good for soups. But for a salad, we want slices! However, cabbages is one tricky type of vegetables. It does take a lot of time and effort if you don’t know how to shred cabbage. The biological structure of cruciferous vegetables more often than a few times causes confusion among home cooks, especially novice ones. Most of people’s first time of handling cabbages ends in some sort of chaos. With a food processor, things can get a bit easier. But, I imagine you still might need a little help. I have been there. So, here are things that’s gonna be in your aid when cabbage is one of the main ingredients of your meal. First, we have to wash them. Remove the outer layers that are usually damaged and dirty. Next, rinse the cabbage under running water to make sure that it’s clean. Sometimes, there are signs of worms or insects in the cabbage. Simply soak the head in salt water or vinegar for about 15 minutes. We should not use carbon steel to cut cabbages since they will react and turn blackish. Stainless steel is better recommended. Use a knife that is longer than the diameters of the cabbage. It will be much less frustrating compared to cutting with a short knife. Lay the cabbage on its stem, flat on the cutting board and cut it in half vertically. A straight down cut is perfect. This is what we should always do with most vegetables: cutting them in half. By doing so, we create surfaces to steady them on the cutting board so we can easily deal with them later. Cut the two halves into smaller halves, straight in the middle of the stem. After that, it should be simple to remove the stem with one diagonal slice on each chunk. Because we are going to use a food processor to do the slicing and shredding, the cabbage should be divided into smaller chunks. 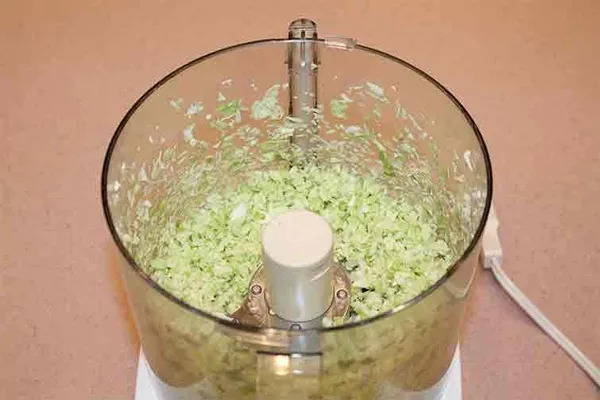 In the case of a 14-cup food processor, we can put in the chute a quarter of one cabbage at a time. Continue to halve the chunks vertically until the pieces fit the chute. This is a judgement call – you can either keep halving them or trim slightly around the edge so they can fit. Do not cut the cabbage horizontally since they will start falling apart. We want them all connected. The more you halve the cabbage, the smaller the slices will be. So if long stripes are desired, I wouldn’t go further than quarters. If your food processor is too small and chopping them into smaller halves begin to feel difficult, it’s time to slice them manually or buy a bigger food processor. Now proceed to feeding the chunks into the food chute and start pulsing; slicing or shredding is complete up to you. A knife might seem slow after this. With napa cabbages, it is going to take some time to wash and make sure they are clean. Because of their texture, napa cabbages are more likely to have bugs in between the leaves. Instead of rinsing or soaking them, I suggest taking the leaves off one by one and wash them separately. It’s cleaner that way. A trick to disconnect the leaves: cut off the stem where the leaves root from and they will fall apart instantly. After cleaning all the leaves, stack them upon each other and start chopping. You will see how easy it is to this manually. If you have a pair of kitchen scissors, you can use them instead of knives. Cut the stack of leaves into halves or thirds, depend on the feeding chute depth. Roll the newly cut stack vertically in the shape of a cylinder. If it doesn’t feel thick enough, add more leaves to the stack. Proceed them into the chute one cylindrical stack at a time and pulse. On a side note, a touch of bitterness in the taste of cabbages is often a good thing when it comes to our physical health. Despite the fact that commercial industry usually tries to remove such bitterness to increase consumption, we should know that a number of the bitter-tasting constituents can be anti-cancer. Rather than getting rid of the so-called unpleasant taste, it would do us well to mix cabbages with varied flavor ingredients, letting cabbages retaining its signature taste within a multi-flavored, delicious dish.